EDITOR'S NOTE 02/28/2018: The new Climate Watch platform is now available, allowing you to explore historical and projected emissions, countries' climate targets and their linkages with the Sustainable Development Goals. As leaders gathered last week in New York for the UN General Assembly, it was a momentous occasion for two unprecedented international agreements adopted in 2015. Last week marked the one-year anniversary for the 2030 Agenda for Sustainable Development and the Sustainable Development Goals, while entry into force of the Paris Agreement on climate change came ever closer as an additional 31 countries formally joined it. These two agreements’ far-reaching goals include eliminating global poverty and achieving zero-carbon, climate-resilient development. A substantial, hugely challenging task? Surely, but new analysis finds that there’s much greater alignment between these two agendas than we may realize. In fact, implementing them together has the potential to generate significant mutual benefits. The Paris Agreement is underpinned by 162 intended nationally determined contributions (INDCs) that detail 189 countries’ plans to reduce emissions and enhance their resilience to climate impacts. The 2030 Agenda consists of 17 Sustainable Development Goals (SDGs), which are further broken out into 169 targets. 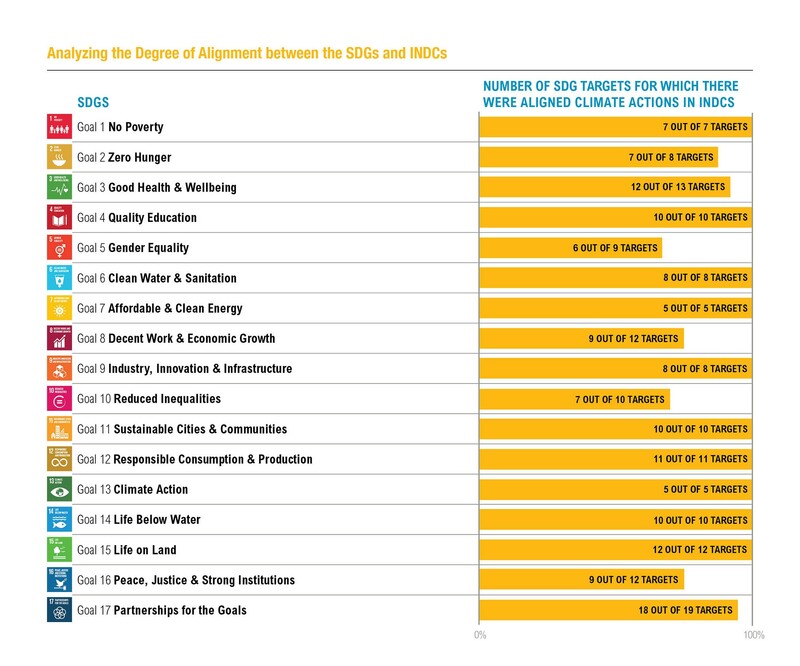 WRI’s new working paper, Examining the Alignment between the Intended Nationally Determined Contributions and the Sustainable Development Goals, finds that the climate actions communicated in INDCs align with at least 154 of the 169 SDG targets. A wide range of actions that countries put forward in their INDCs – both for mitigation and adaptation – provide enormous potential for mutually supportive implementation with the SDGs. The degree of alignment demonstrated shouldn’t be surprising. Climate impacts have the potential to slow, and even reverse, progress on the SDGs. For instance, the 2013 UNDP Development Report warns against a potential setback in poverty eradication in Peru and the country’s Bicentennial Plan for 2021 estimates climate change cost up to 20 percent of the national GDP by 2020. Climate action is essential to stave off these impacts. But even more immediately, well-designed policies and actions to reduce greenhouse gas (GHG) emissions and enhance resilience to climate impacts can provide broader sustainable development benefits. We saw the strongest areas of alignment between the INDCs and SDG targets related to poverty alleviation, energy, agriculture and land use, forestry, infrastructure and cities and human settlements. For example, Thailand’s INDC identifies ambitious actions under its Environmentally Sustainable Transport System Plan, including extensions of mass rapid transit lines, construction of double-track railways and improvement of bus transit in the Bangkok Metro areas. Implementation of these actions has the potential to contribute to SDG target 11.2 to provide access to safe, affordable, accessible and sustainable transport systems for all while improving road safety. When it comes to actions aimed at increasing resilience and adaptive capacity, Mexico’s INDC commits the country to improve watershed management and land conservation in order to guarantee food security and water access in the face of growing climate threats such as drought, floods and storms. This aligns strongly with SDG target 2.1 to end hunger and ensure all people’s access—particularly the poor and vulnerable—to safe, nutritious and sufficient food year-round by 2030. Meanwhile, advancing action on the SDGs can in many cases contribute to mitigation and adaptation. For instance, Niger’s INDC identifies the lack of literacy and numeracy in rural areas as a significant impediment to disseminating the technologies needed for climate-smart agriculture and land management. By targeting these rural communities in implementing SDG target 4.6 to improve literacy and numeracy by 2030, Niger can lay the necessary foundation for achieving its climate goals. To complement the global-level analysis, the paper also examines the extent of alignment between individual countries’ INDCs and the SDGs. We selected Colombia and Uganda for this exercise because they are two of the first countries to translate the SDG targets into their national development plans. 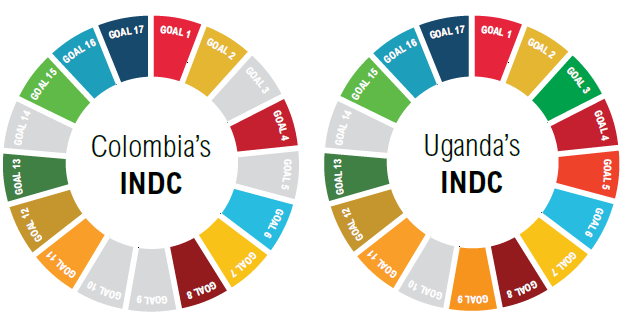 In the case of Colombia, climate actions in its INDC aligned with 40 of the SDG targets across 12 of the SDGs; actions in Uganda’s INDC aligned with 56 of the SDG targets across 15 of the SDGs. This shows that even at the individual country level, there is significant scope to align these agendas and generate mutual benefits during implementation. However, despite the scale of potential alignment, countries’ climate plans may not fully recognize or capitalize on these opportunities. Similar mapping exercises for all countries can help identify opportunities for aligned and integrated implementation. The climate and sustainable development agendas are no longer distinct challenges to be pursued in tandem, but rather integral components to achieve a low-carbon, climate-resilient future. Recognizing the extent of alignment that exists between the two agendas is a first step in understanding the benefits of approaching national and sub-national implementation in an integrated manner. Though coordination at the national level often remains a challenge, countries can seize the available synergies by bringing together institutions and developing an integrated approach to planning, budgetary and monitoring processes. Tackling the SDGs and INDCs together can maximize scarce resources, catalyze information-sharing and technology development, enhance capacities and skills—and ultimately, create a better world for all.